At ThingTank we really love a tool like Slack because of its simplicity and extensibility. Like so many, we use it to get notifications from all sorts of systems. A lot of websites and tools integrate with Slack such as Azure Logic Apps or CI systems like Shippable. Those types of integrations are very easy to configure. But what if you want to send commands from Slack? You would typically use a slash command for that. Some common commands are /giphy to insert an animated GIF or /hangouts to start a Google Hangouts session. In this case, we wanted to create a slash command to tell our CI system (Shippable) to run a build for a project. We found that one of the simplest ways to do that, is to use Slash Webtasks from those clever guys at Auth0. We already use Auth0 for securing our back-end APIs and we really love the way they think about developer productivity. You will first have to install the Webtasks app from https://webtask.io/slack. After that, you will have a new slash command in Slack: /wt. This is just a Hello World example that says hello to you in Slack. You can invoke it with /wt builder and you will get a response like Hello @geba. The context object provides access to all sorts of goodies like in this case your user name in Slack. 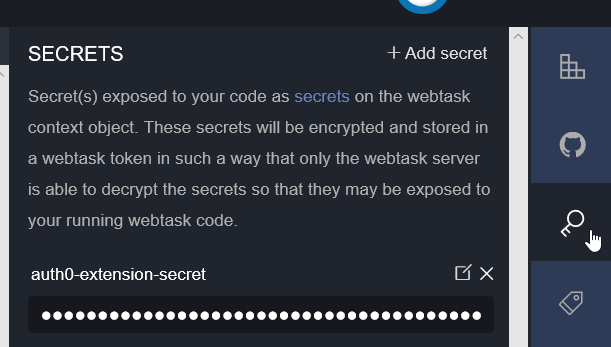 Retrieve the Shippable API key from the secrets you can store in Slash Webtasks. We’ve only touched on the basics here but there is not much more to it. 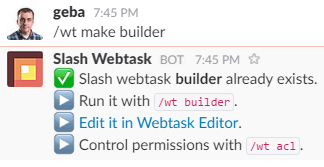 If you are looking for a simple way to create custom slash commands in Slack, give Slash Webtasks a try. It’s really fun to work with and it’s very elegant. And by the way, Webtasks on its own can do much more. It’s one of those serverless solutions but it has some nifty features such as Express integration etc… Maybe I’ll cover that in another post!